Anyway, I’ve really enjoyed making Omar’s recipes and I am always up for a challenge. So, first my very Christmassy Chocolate Orange Olives, made with Mexican smoked chilli, 100% cocoa and a little orange zest. I HAVE tried black olive truffles – made by Omar and also at Simon Fernandez’s supper club Ferdie’s Food Lab. And they worked, so why shouldn’t these? I have to admit, I was just a little nervous about adding in the chocolate and I divided the olive mix in half to see if it really worked. A bit like Mexican Mole, this marinade is smokey, deep and robust. 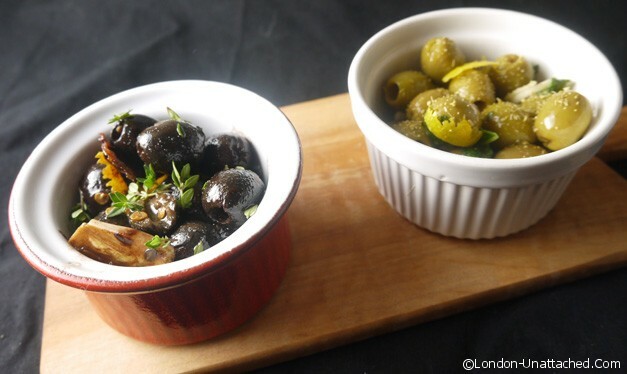 I’d eat the olives with cheese after a meal rather than as an aperitif. Add all the olives and stir well. Allow to marinade for at least 2 hours, preferably overnight. Serve at room temperature with a few sprigs of fresh thyme for decoration. For my second recipe I thought it might be a good idea to chose something a little lighter. I love the combination of sage and lemon and so a sage and lemon marinade seemed like a perfect idea. But, when I’d finished, the result was just a little sharp. I have some wonderful fennel pollen that was sent to me by Global Harvest to experiment with and I added just a pinch…a lovely sweet, aniseed taste that perfectly complimented the existing marinade and finished the dish. Serve at room temperature with the fennel pollen sprinkled over. If you are substituting fennel seeds these should be added to the marinade at the start. I’ve loved this particular challenge. It’s probably because there isn’t any real cooking, but the end result is interesting, unique and something I think I could and would do again. Of my two recipes, I really do like the black olives with chocolate and orange. I was suprised it worked and I am not sure, if I served them to other people, that I’d ever admit the ingredients until they had been tasted because it just sounds a little implausible. 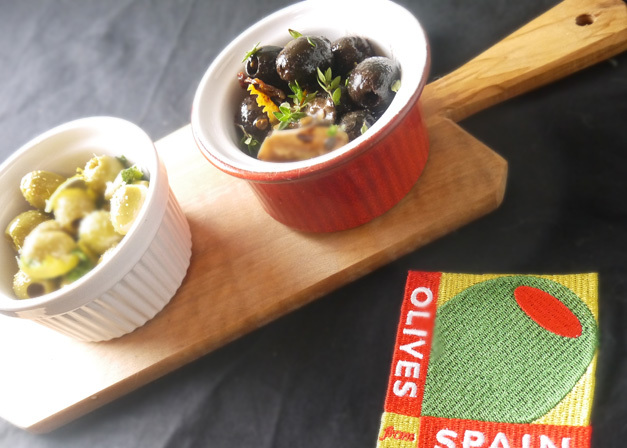 Many thanks to Olives from Spain for inviting me to take part and for sending me a great selection of ingredients to use. Wow – what exciting olive marinade flavours – they sound really intriguing and look beautiful! Olives…seriously one of my favorite foods that I just developed a taste for in the last year or so. How I lived so long without loving these little creatures is beyond me! I’d never have actually thought to marinate my own olives before reading this. The first marinade sounds amazing. I was pretty amazed that the first one worked so well, but it did! I think the idea is that you can buy plain canned olives and then create your own marinades at a fraction of the cost of the shop bought ones. Plus, you get to chose the flavours that work! thanks karen, hasn’t it been fun! How very creative you have been Fiona, love the cocoa in the marinade. Oh I just love your marinade using Rococo cocoa. Such a clever idea and one I know I would enjoy. The smoked Mexican chilli sounds good, chipotle is such an interesting intense flavour. Thanks for passing on my details and this challenge has been great. There are so many more olive fans around than I ever realised!